Hofstra University will close at 1 p.m. today, January 26 and remain closed Tuesday, January 27 due to severe weather and travel restrictions. Please check hofstra.edu for updates. 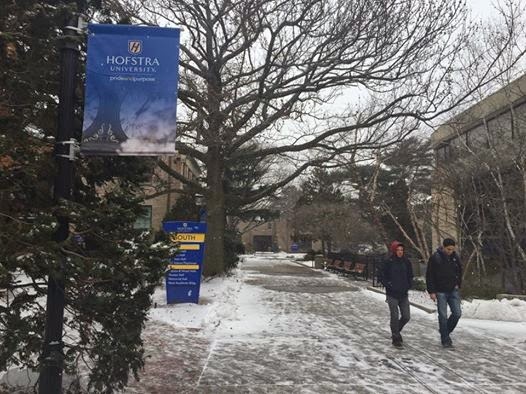 The snow is already starting to fall here on campus, and Cristina shared a few things Hofstra students can do on a snow day! Snapchat the temperature. Let all your Snapchat friends know that class is canceled. Take a picture of the snow or a shameless selfie and add the temperature filter. Sleep in. Snow days are an excuse to be lazy. Sleep in since you won’t get too many opportunities like this during the semester. Build a snowman. Don’t think just because you’re a college student that you’re not allowed to play in the snow. No one is ever too old for that. Clean your room. Take advantage of the day off and catch up on some laundry or organize your room. Binge-watch Netflix. Stay warm by gathering up some friends in your building or isolate yourself in bed for the day. Go Ice Skating. The Twin Rinks at Eisenhower Park is only a 5-minute drive from Hofstra University. If weather conditions allow you, drive over and reminisce on your childhood. If you’ve never been ice skating before, this is the perfect time to learn. Bake or cook. If you have some ingredients lying around, bring them into the kitchen. Challenge yourself and see what you’re capable of making. Catch up on schoolwork or studying. Maybe a snow day canceled that test you’ve been stressing about all week. Take this day to catch up on all your schoolwork. Surf the Internet. Lie in bed and search through the Internet. Watch YouTube videos or go on Facebook to find out what your high school friends are up to.